Live to ride or ride to live? Either way, this is my blog. Snow. It’s magical. Whereas the world usually changes imperceptibly slowly from season to season, snow takes the dreariest winter vista and transforms it within the space of a few hours, creating a winter wonderland (sorry, couldn’t quite come up with a more effective and less well travelled metaphor). When it falls, children abandon their electronic baby sitters to venture out, to build and throw and slide. Snow men are born of imagination and never far away, children of all ages race down icy slopes with reckless abandon, mostly out of control. And why not? A) Many rightly stay at home. C) A few skilful drivers get stuck behind or struck by those in category B. D) The final category includes all of the above but they benefit from extra driven wheels, fancy diffs and sometimes even clever electronics. Very occasionally, they even have the tyres for it. Not me. I come under a different heading. You see, I still get excited when the white stuff begins to fall, more excited than my own children as it happens. I don’t know why I do. It makes no sense at all really, being a motorcyclist with a big hill between me and where I need to be. If you had to stick me in one of the above though, it would most certainly be B). My bike has the scars to prove it. You see, I am obsessed with adventure one way or another. I also have a mortgage, children, a job, a wife and all the usual mundane commitments of being mid 30s and a teacher. 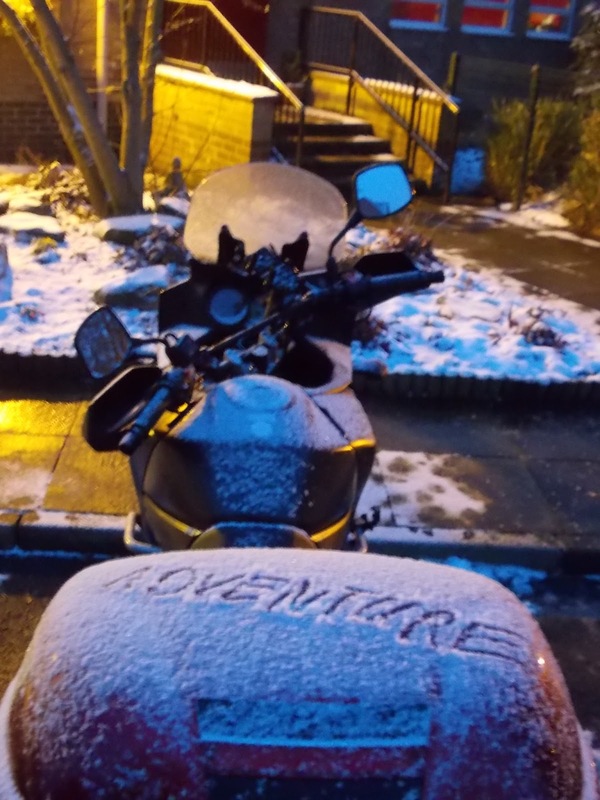 For me, adventure is pretty hard to come by so when the snow fell a little bit, earlier in the year, I rode to work. The main road was cleared so why not. The moor road turned out to not be clear having perhaps 2cm of snow but I figured I may as well have a go. What’s the point of fitting the bike with dual sport tyres if you aren’t ever going to use them. That went well. As a matter of fact, it went without a hitch. Not so much as a slip or twitch of the rear. I was straight up the steep, snowy hill and back down the other side. Repeat a few more times. Arrive at work. Easy! The next time, same thing but more snow and a bit of wind. I was off on an adventure, excited and intrepid. Before long I would be feeling like a right Charlie. It was not yet 5am as I set off up the A59. Within the first mile, police were holding the road as a car was hauled out of the ditch by a recovery truck. I didn’t think better of it and motored on, carefully, slowly. The other option was after all, the far longer main road route. When I reached my turn off, steep at about 20% I was unsurprised to find it unploughed. A single set of car tracks told of a single other vehicle having braved the route since the snow fell that night. Again, I didn’t turn back. Riding in the car tracks, I made the ascent easily. The first steep descent, even with the tight bend right at the bottom, suggested I was going to be fine. All very affirming. Crack on. It was beautiful too. Calm, with a silence that seemed able to penetrate the throb of the exhaust (that sentence describes it best but don’t ask me to explain it). There was even a wonderful few seconds when the owl I have seen dart across the road many times before chose to glide along beside me before pealing off between the trees that skirted the road. It seemed to me at the time that it did that because of the snow. Now I wonder if it was just the slow and quiet progress I was making, perhaps a little over a jogging pace. In that moment I had absolutely done the right thing. This was absolutely worth the risk of a low speed drop, the only type possible at the speeds I could reach. Within minutes of sharing a few seconds with the owl, I was off the bike. It wasn’t down but we weren’t getting up that hill. Category C folk will have noted when I mentioned a bit of wind before. With wind comes snow drifts, especially on higher exposed ground. Manageable on the flat but trying to climb through one changes everything. The car tracks I was using were gone and the only option was to dissmount and kick a path through. Tough work when you’re wearing all your gear. I began to wonder if I had made a mistake. For some reason though, I literally ploughed on. By the top of my ride, I was already exhausted, physically and mentally. And all the while, I’d been riding on snow with grit underneath. The first time I fell was just plain stupid. Embarrassingly dumb. I had this coffee in my box and was thinking, ‘I’m tired and should take a break.’ There’s this layby on the top road and I figured that would be the place to stop and drink the coffee. Being category B or there about though, I hadn’t figured that the world would look so different or the slight slopes on slight bends would be such a game changer. As I was passing the layby I wanted to be in, I noticed I was doing so. I didn’t notice the slight down hill slope and gentle left curve. The moment I shut the throttle down, things got real. There I was, lying in the road. Looking back, I’m not sure what I was thinking though there would doubtless have been expletives. I do remember thinking I was in real peril as someone could come along at any moment and my bike in the road would cause an accident. Fortunately, there was sufficient adrenaline and grip for me to lift Hamish up. As it turned out though, no one else would pass along that road for nearly an hour and that was a gritter truck. Immediately, I could see the front left indicator was gone and the bar end weight was bent. With hindsight I can also see the RDR (rider) was also shot. In the pre dawn cold light of night, I didn’t spot that and couldn’t really do anything about it anyway. The bike, having cut out exactly as it was designed to do, restarted. I should thank the previous owner who had fitted engine bars to it, preventing far worst. Satisfied the bike was still ridable, I mounted up, started up and attempted to motor on, the coffee long since forgotten about. A quick word count tells me this post is getting too long. The clock tells me it’s bed time. Common sense says this post may be better as a two parter so there I shall leave it. However, I must share this video I found on youtube.com All I can say is, wow! I wish I had their tyres. If you can, please leave a comment to let me know you were here, where you're coming from and what you think. It's snowing down here in the South of England - almost a kind of adventure when it happens! The problem with adventure, for the male motorcyclist of today determined to experience some adventure in his life, is that today's society portrays adventure as a goal for desperately-bored people to yearn for; something for those seeking to escape the stultifying boredom of their lives in boring, utterly pointless jobs (for example, the primary 'skool teecher' doing his best to teach children (50% of whom apparently have ADHD, the condition previously known as 'being bored to death by boring teachers') to look forward to becoming part of tomorrow's dreary-eyed work force in an iPod-listening, consumer-driven, spiritually-dead, self-pleasing world which has not the faintest concept of any purpose or direction in life. I'm thinking of adventure travelling on a Suzuki Inazuma 250 through Spain this June. At the moment, I'm reading some books about St James in Spain and about the vials discovered of the Virgin Mary's Holy Milk, the True Breath of Jesus, some drops of the True Tears shed on the True Cross, the True Holy Foreskin, the Most Precious Splinter of The True Wood of The True Cross Of The True Holy Trinity of The True Christ, even St James' True Bones and all the other 'True' and much-venerated stories & relics of the True & Holy Roman Catholic Church. Apparently, the quiet and peaceful St James, known in Spain as 'Santiago the Moor-Slayer' (and Great Medieval Adventurist), travelled all the way from the Middle East and with the aid of the Lord managed to slay 70,000 of the Moors (Muslims) during a ride-out on his 'charger'. Now, wasn't that an adventure! The problem is - many people don't have the faintest idea what they are doing with their lives or why they are living. Many people are bored. They don't believe in anything, anymore. Many did once believe that there might be something else in life but with Christmas, Easter and Saint's Festival Days adopted by the Catholic Church from their pagan origins to be the nonsense that they are today where Christ is forced against his will to be stuffed into secular, commercial festivals, many rightly can't trust the church anymore to tell them anything truthful or anything which might result in a better life here on earth - only the possibility that if one behaves themselves they may one day float in heavenly bliss on puffy white clouds with Jesus for company. The true message that Jesus preached for mankind and recorded in the Bible as part of his Sermon On The Mount, that of establishing his kingdom on earth as well as in heaven and of restoring paradise (ie: park or garden) for everybody on earth to enjoy again (not in heaven, the governmental place from which he rules together with his angels) has been gradually erased by the church over the course of two millenia to be a virtually non-existent message in many people's minds today. Maybe an adventure to a remote place might just not be a bad idea. I shall find out soon. Good grief. I spend hours trying to get the children in my class to quote scripture like that. Thanks for the reply. First I've had in months. That Inzuma looks like a cracking bike. I'll be keeping tabs to see how you get along on your travels. My last bike was a Yamaha YBR250. Dead simple, mildly economical but broke down a lot. Sacked it as soon as the warranty was gone. Exactly the same story with the Hyosung GT250 I had before that. The YBR was a great chassis. Handled beautifully but was gutless in the extreme. The GT250 handled like a dog, especially on it's awful stock tyres. The engine was a real peach though. Had to move up to a 650 to go +wife touring. Still prefer to ride her little 125 if I can. Ride safe and have fun. as mentioned I doubt I could get on a bike in those sort of temperatures. No one enjoys an off but its all good if you can walk away and write about it without injury. It's not always snowing here fortunately but I take your point. I don't think I could handle not riding. It makes me all... Can't describe it but it's not nice. Thanks for the reading and especially for the feedback. Please leave a comment if you can. Let me know what you think. I crave feedback and human contact.